Eusebi Impianti self contained fire fighting system EI PACKAGE is one of the main service offered to provide customers with an easy assembled and tested system that ensures an important reduction of space thanks to its compactness. The automatic sprinkler fire extinguishing system is made up of a set of automatic extinguishers called sprinklers and the relative supply piping containing water, compressed air or ambient air (deluge systems) and control valves fed by water supply sources of suitable flow rate and autonomy. They also include a test device and an alarm bell. The sprinkler heads can be open (deluge systems) or closed, generally the closure is accomplished by a quartz bulb filled with a special liquid with a high dilation coefficient. When a fire breaks out in the area protected by this system, the rise in temperature causes the glass bulb to break and the water to be sprayed from the nozzle. The System is therefore designed in such a way that, depending on the risk, the quantity of water that is distributed by the sprinkler heads that open is enough to extinguish or keep the fire under control. The systems used to protect inflammable liquids use synthetic low expansion AFFF foams that act very quickly, spreading over the surface of the liquid on fire. Unlike traditional foams, aqueous filming foams not only form a consistent layer of foam but also generate by drainage an aqueous film that excludes the surface of the inflammable liquid from coming into contact with the air and so prevents the releasing of vapours. In the event of breakage at some point in the continuity of the film, the latter has the ability to autoregenerate itself. In the event of applications on polar solvents, which are water soluble, the use of alcohol resistant AR-AFFF filming foam is necessary. Once applied on polar solvents, the polymers (polysaccharides) contained in the foam form a polymeric film over the surface of the liquid. The polymeric film is generated by a reaction between the polar solvent and the water that is drained from the foam. The aqueous film that floats over the polymeric layer maintains its ability to autogenerate itself and contributes to extinguishing the fire and suppressing any vapours. 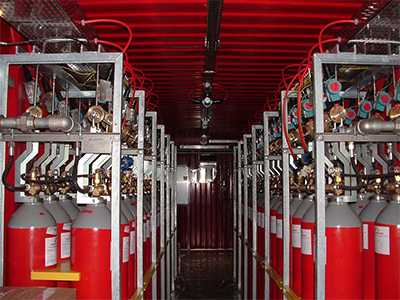 ARGOSYSTEM � uses argon as an extinguishing gas: argon acts on the fire by decreasing the percentage of oxygen from 20.9% to below 15%, which is theoretically the threshold below which the fire should go out. The saturation principle used is of the total flooding type. ARGOSYSTEM � reducing the oxigene percentage to the 12%, allow human being presence and extinguish the fire. The Argon gas required to extinguish a fire is stored in special 80/140 litre T-PED approved cylinders, in which the gas is pressurized at 200/300 bar. The pipes required to transport and dispense the Argon gas IG 01 are made of galvanized steel API 5L Schedula 40, complete with fitting type ASA Series 3000 downstream from the pressure regulator, while the manifolds upstream exploit pipes type 160/XXS. The radial spraying nozzles, with outlet diameter made according to hydraulic calculations, distribute the gas uniformly in the room with the required design concentration. Any over pressure that may form in the protected area after the extinguishing agent has been discharged will be reduced by one or more overpressure gate valves, equipped with pre-calibrated springs that evacuate the pressure in excess. The applicable standard imposes a leak measurement test, called FAN DOOR TEST, to check the physical characteristics of the rooms to be protected and to process the project correctly. The system is activated by means of the smoke detectors.